NUMBER 168 and joined OVER 20 YEARS AGO ! Come stay with us and enjoy the Finger Lakes Region and spectacular Seneca Lake from our lovely cottage located eight miles south of Geneva on the east shore (that means the best sunsets you will ever experience) ! 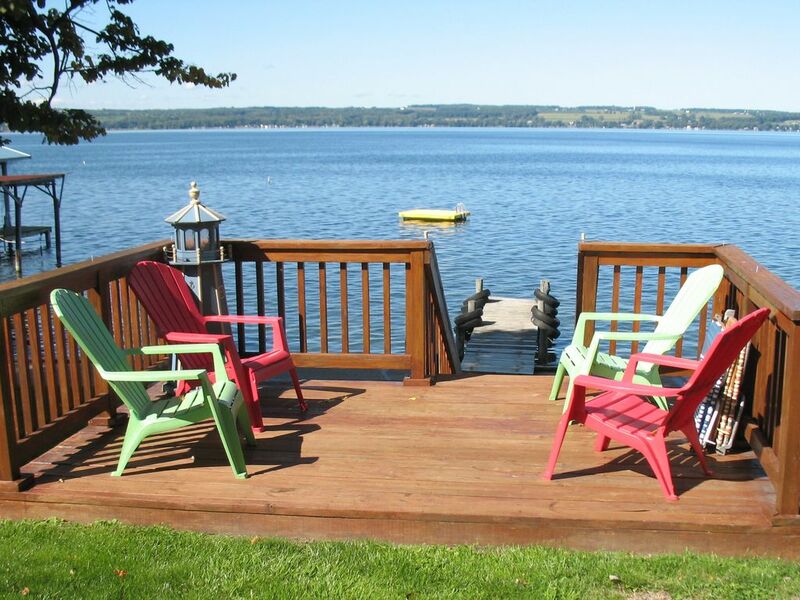 We are truly one of the finest Finger Lakes Vacation Rentals. We have great swimming, boating, fishing, water sports, sun, and absolutely gorgeous sunsets, all on lovely private lake frontage. We are ideally located in the heart of New York State's Finger Lakes, just minutes away from the best Finger Lake's attractions, restaurants, and wineries. And we have free Wi-Fi for all your computing pleasures !! And we now have complementary wine tasting vouchers for all of our over 21 guests ! Living Room with 32 Inch Cable HDTV, Internet, Blu-ray/DVD player, Streaming Netflix (with thousands of movies and TV shows at your finger tips), DVD’s, stereo radio, lots of books and games, a gorgeous working stone fireplace, and dining area with table and chairs. Master Bedroom with king bed and a brand new Serta hotel quality luxury mattress. If you do not have king sheets we will provide them for you (complimentary) ! Second Bedroom with two sets of bunk beds. One of the bunks is twin over twin and the other is twin over double. The lower double bed has a brand new Tuft and Needle luxury mattress. There is also a cable TV with DVD/VHS player with lots of old VHS tapes. Roofed Patio on the lakeside, just outside the front door, with outdoor fireplace, propane grill, Adirondack chairs, lawn chairs, lounges, and picnic table. Deck with Adirondack chairs and six stairs to the lake level. Dock with lake depth two to three feet. The lake depth very gradually deepens as you go out. It is about five feet at our bright yellow swim float. Beach with more colorful Adirondack chairs, lounges, and 40 tons of round stone just installed. Wait until you see our Jimmy Buffet beach theme! An Electric Boat Hoist is available for a nominal charge. Front and Back Yards, meticulously landscaped with an incredible display of flowers, foliage, and plenty of lawn. The cottage is completely furnished including dishes, silverware, coffee maker, filters, pots and pans, etc. We also provide all paper supplies, soaps and shampoos, bath mat, blankets and pillows. Just bring your sheets, pillowcases, and towels. Note: If you are flying in and are cramped for suitcase space, we will provide these also ! We are well off the road and have plenty of parking. If you are fishing enthusiasts like we are, you will find some of the best fishing in the state on Seneca Lake. We catch panfish right off the dock. If you have a boat, we will show you how to catch the beautiful abundant Seneca Lake lake trout as well as the landlocked salmon, rainbows and browns. Boat rentals are just five minutes away and we are happy to arrange a rental for you. The owner of this vacation property is a United States Coast Guard Licensed Captain and is offering renters special rates on fishing charters in his fully equipped boat. Special rates are $99 per person for half-day fishing. Please search: Captain Joe's Seneca Lake Charters. Private boat tours of the lake are also available with the Captain. Just for you, we have written and assembled a “Welcome” book. It presents all of the information on the cottage and the area, including directions to the restaurants, wineries, attractions, bait stores, grocery stores, shopping areas, and much more. We are sure you will have a very enjoyable vacation at our cottage and look forward to hearing from you. Joe and Pat reside in Marcellus, NY and have been married for 44 years. Joe is retired from Eastman Kodak and is now a chemistry teacher/tutor and a fishing charter captain. Pat is an English teacher. They both enjoy their cottage which is right next door to the rental cottage. Purchased in 1986 and 1992 respectively, the cottages have been a great source of relaxation and enjoyment in the beautiful Finger Lakes region. Their two children grew up loving the lake. Joe and Pat take pride in providing outstanding customer service to their guests. You are assured that your stay will be one of your most memorable vacations! We hope to see you soon ! We have absolutely everything you need. Gorgeous lakefront view Amazing unsurpassed sunsets. Immaculate cottage. Great roofed patio, deck, and dock. Beautiful grounds and flowers. Owner next door and at your service ! Gorgeous 50 feet of private lake frontage, including private dock and swim float. Cookware, utensils, indoor & outdoor fireplaces, propane heat, cable TV, roofed patio, deck, dock, propane grill, picnic table, lawn chairs, phone and more! A boat hoist is also available. No more than 8 people allowed on the property at any time.